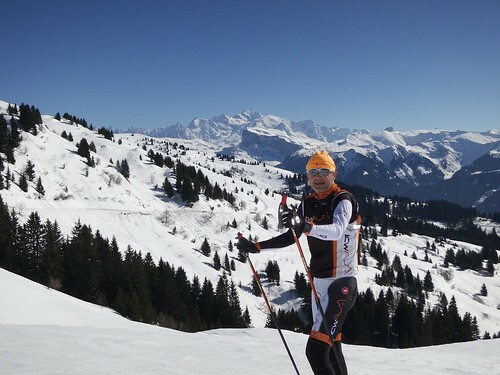 You are at:Home»Cross Country Skiing»Col de Joux Plane – Duathlon? 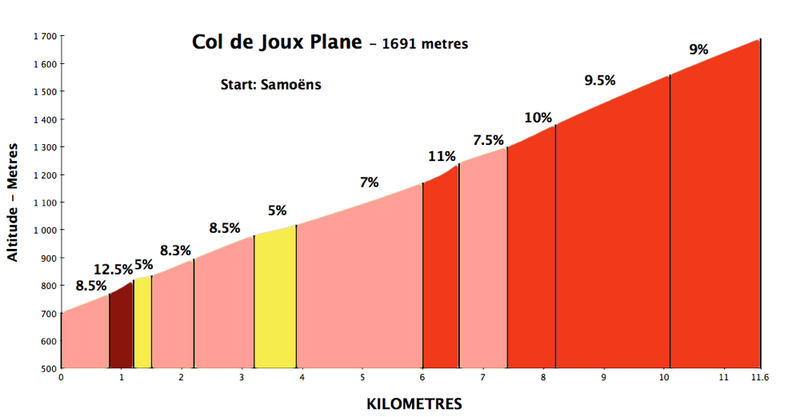 Col de Joux Plane is another of my very favourite winter climbs. 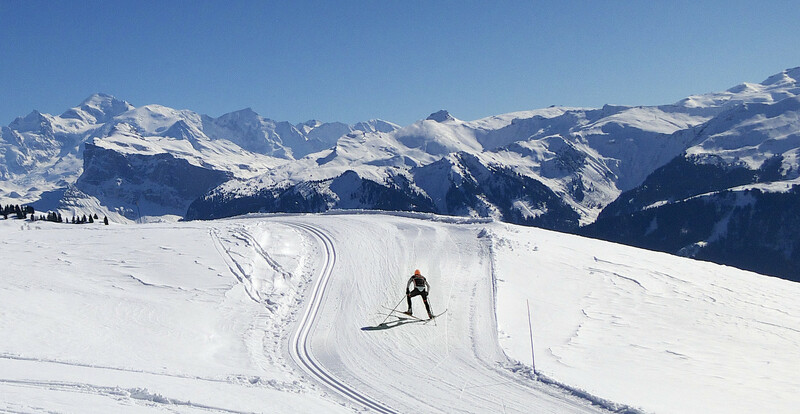 The Morzine side is used as a ski slope and closed until May, but when the weather gets warm and the cross country si trails at the bottom of the mountain close, they often open the road to Joux Plane from the more famous Samoëns side and groom roughly 10 kilometres of XC ski trails. This also means the road is open for bikes. I arrived at the col and – on a whim – asked the guy at the little hut if they rented cross-country skis. They do. I counted the various euro coins at the bottom of my knapsack, put them on the counter hoping I had enough money. He counted and said that I had enough for a ticket, equipment, and a beer. Good news. I have quite a few Joux Plane rides here – use the search box. For a third way up by mountain bike see here. For the best, biggest road bike loop (either direction works) see here. The groomed trails are unbelievably beautiful. Fabulous views of Mont Blanc, and the surrounding mountains. The main red trail heads up to a great look-out with an orientation table and a giant cross (see map below for location – it is also a good hike from the col). An exhausting but fun “duathlon”. 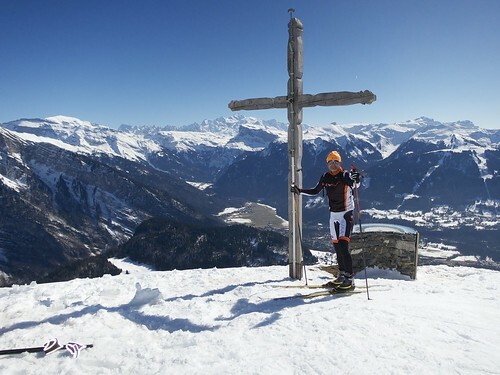 There are definitely more Cols with cross country skiing (with rentals) at the col summits worth a visit. For example: Col des Glières, Mont Revard, Plateau de Retord (Col de Cuvery), La Vattay (near Col de la Faucille), to name a few. How is it skiing in cycling shorts? 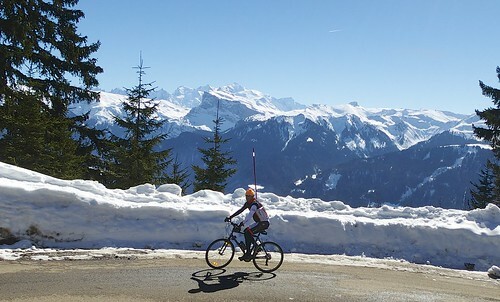 Some more suggestions for this kind of fun: Col de la Givrine (above Nyon), Col des Mosses (above Aigle), and Gurnigel (between Fribourg and Thun).